Half Vision showcases are literally that - the top half is for display and the bottom half is for storage. 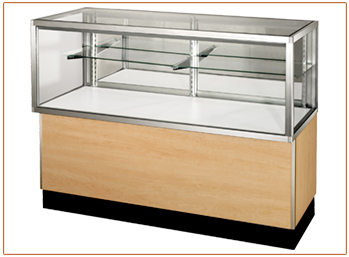 Half Vision showcases allow the vendor to display merchandise along with a beautiful wooden base with rear storage area. Streamline Half Vision showcases are best in retail stores where you have less merchandise to display, or when you want thecustomers to get a closer-up look at your products. The overall dimensions of a standard Half Vision showcase are 38” high and 20” deep, with 4 different lengths available. The glass case is 18” high and 20” deep. The recessed wood base is 16” high and 17.5” deep. The base on a standard case is open on the clerk side with the option of adjustable shelves (standard not included). The black kick base is 4” high. Half Vision showcases have one row, 10” deep glass shelving. The 36” and 48” showcases come with one shelf per row; the 60” and 70” showcases come with two shelves per row. To view more showcases from the Streamline Half Vision series, click here.